We’re heading toward a Wild West shootout between the U.S. dollar and gold. Somebody’s wrong. Somebody’s going to get hurt. And somebody’s going to get rich. I’d rather be in that last group. How about you? Let’s start with the highty-mighty U..S dollar. It has been rangebound since May. But underneath the surface, there’s a lot going on. 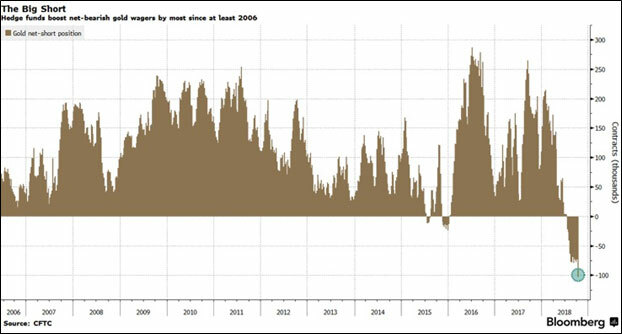 Here’s a chart of net-long speculators in the greenback. 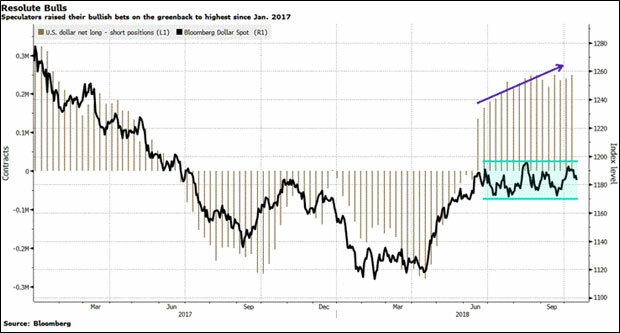 Speculators have increased their net long positions in the U.S. dollar to the highest level since January 2017. That’s according to the latest data from the Commodity Futures Trading Commission. Why does this matter to gold? Because gold is priced in dollars. As one goes up, the other usually goes down. I call that the “Seesaw of Pain.” And more and more speculators think the dollar is going up, which means gold is going down. Wow! That’s hugely short. 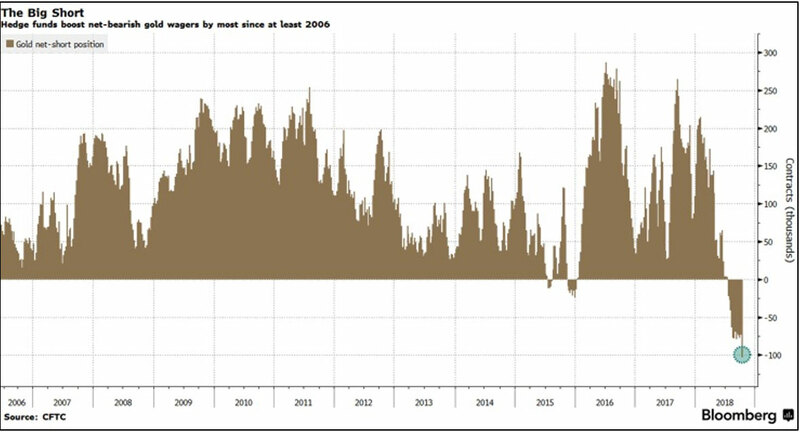 The biggest net-short in gold since at least 2006. We only have data until Oct. 9, right before the Dow and S&P 500 started tumbling, and gold blasted off. I wonder if any of those shorts have regrets? Personally, I think gold miners look cheap. Dirt-cheap. I have hammered this home in a series of recent columns, like this one and this one and this one. The battle lines are drawn. The clock is ticking down to high noon. 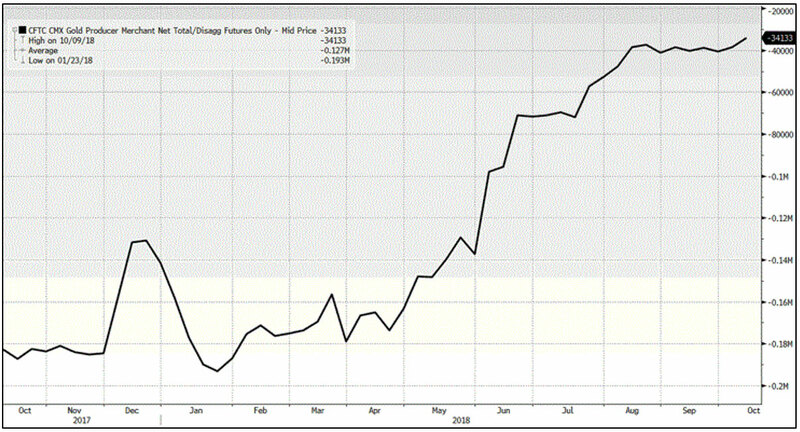 Gold and dollar speculators are about to draw down on gold producers, in the dusty streets of a Wild West boomtown. I and my subscribers have made our bets. We believe gold walks away victorious. Do your own due diligence. If you agree with me that gold has the real firepower, you can read my previous articles to see how to play this. 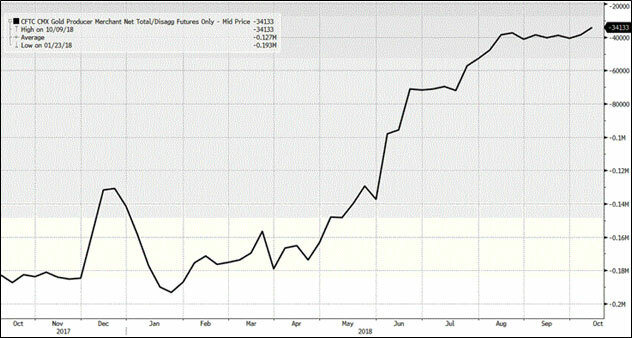 Last week’s price action in gold, began with a $60 million dumping of Bitcoin. The algorithmic systems picked up on it, bought gold, and set off a short covering rally. If smart money is moving from Bitcoin into gold that’s new.